(Washington, DC) Chief Financial Officer Natwar M. Gandhi announced today that the District of Columbia received an unqualified or "clean opinion" from the city's independent auditors on its Comprehensive Annual Financial Report (CAFR). The financial statements also reveal that the District ended Fiscal Year 2001 with a general fund operating surplus of $77.6 million. This audit is a milestone for the District because it is the first clean bill of health the city has received outside the congressionally-mandated control period. A clean opinion indicates that the city's financial books are in order. It also means that the CAFR fairly presents the District's financials and the results of its Fiscal Year 2001 operations in accordance with generally accepted accounting principles. "This reasserts the fact that the city's elected leaders are responsibly taking care of the District and its finances without the need of a control board to oversee our financial operations," said Dr. Gandhi, who was joined by Mayor Anthony A. Williams, Council Chairman Linda W. Cropp, and Council member Jack Evans. "As chief financial officer, it is my responsibility to be the guardian of the District's financial viability. I will continue to keep the lines of communication open with every key stakeholder and citizen, and alert them early and often of the District's financial posture." Mayor Williams said, "I am proud of the District's financial recovery. With the help of the Control Board, the Council and the CFO, we have moved from financial crisis to financial stability. And we did it in just five years' time. For citizens, this means that the District is able to invest in strong schools, safe streets, clean communities, affordable housing, reliable transportation, and health care. And we have been able to attract new investment to our city in direct response to strong fiscal management." 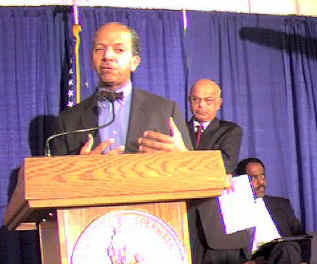 Despite the successful end of Fiscal Year 2001, Dr. Gandhi foresees fiscal challenges ahead as the District continues to respond to the economic impact of the September 11 attacks, works to close spending pressures for Fiscal Year 2002, and finds remedies to the District's structural imbalance issue. "There is a structural imbalance inherent in the city's budget, which, if not addressed, may eventually precipitate spending in excess of revenues or serious cuts in city services," Dr. Gandhi explained. The city is prohibited from taxing federal real property, which comprises 42 percent of the District's property value, while other non-municipal tax-exempt property, such as universities, comprise an additional 11 percent. Further constraining the District's tax base are restrictions on taxing income at source, which means that the District can tax just 34 percent of the income earned within its borders. The District also provides state-like functions such as human services, mental health, and higher education estimated at $500 million annually. KPMG Peat Marwick, LLP conducted this year's independent audit under the auspices of the District's Inspector General. Good day, everyone. I am Natwar M. Gandhi, Chief Financial Officer of the District of Columbia. I am here to brief you on the results of the District's FY 2001 Comprehensive Annual Financial Report, or CAFR. I am very pleased to report that the District of Columbia received its fifth consecutive unqualified (or clean) opinion from the city's independent auditors, with our CAFR completed ahead of time and with a balanced budget. A clean opinion indicates that the city's financial books are in order, and means that those books present fairly the city's financial information and results of its financial operations in accordance with generally accepted accounting principles. Overall, the District ended FY 2001 with a surplus of $77.6 million, and a positive fund balance of $562.2 million. In FY 1996, there was a negative fund balance of $518 million, so we have witnessed a turnaround of over a billion dollars since then. The District's unrestricted fund balance is $91.3 million, and we now have emergency cash reserves of $100.8 million. This year's results add another milestone to the financial turnaround that began in the 1997 CAFR, and is a fitting beginning for the District's recent return to Home Rule. It proves that the elected leadership of the District is prepared to manage the financial affairs of the city on its own, without the need for a control board. I believe we are in a good position to continue this progress. We have instituted several changes in financial systems that give us a much better picture of our financial posture as we go through the year. With regard to financial management, we have increased the flexibility of the city's reserves and at the end of FY 2001 had $100.8 million in cash reserves available. We estimate this amount will grow to about $250 million by the end of FY 2002. Along with our ending fund balance of $562.2 million, these steps should solidify the District's improved bond ratings, and contribute to lower borrowing costs in the future. Two studies are underway that may also contribute to this progress. In the District's FY 2002 Appropriations Act, the Congressional Research Service was directed to study the way ten national capitals and the District are treated by their supporting jurisdictions. And recently, the chair of the Senate's Appropriations Subcommittee on the District of Columbia requested that the General Accounting Office study the District's structural imbalance and recommend solutions. As you know, there is a structural imbalance inherent in the city's budget, which, if not addressed, may eventually precipitate spending in excess of revenues or serious cuts in the city services. The District is prohibited from taxing federal real property, which comprises 42 percent of the District property value, while other non-municipal tax exempt property, such as universities, comprise an additional 11 percent. Further constraining the District's tax base are restrictions on taxing income at source, which means that the District can tax just 34 percent of the income earned within its borders. The District also provides state-like functions such as human services, mental health, and higher education estimated at $500 million annually. In addition, there are a few concerns. For FY 2002, we already have identified approximately $240 million in budget problems, including some $39 million in lower revenues even after assuming the implementation of the Tax Parity trigger that automatically postpones income tax rate reductions until next year. The balance of $201 million is spending pressures, the largest of which are $81 million for DCPS and $62 million for projected Medicaid shortfalls across all-programs. We believe we can manage these issues, but only by using all of the District's uncommitted funds and by some form of congressional action, including a supplemental appropriation for our uncommitted funds. This means that balancing the FY 2003 budget will require tough analyses of issues and even tougher decisions on programs. But none of these concerns should detract from today's accomplishment. I want to take this opportunity to thank the many employees, from financial and program areas, who have worked so long and so hard to ensure both the successful closure of the District's books and that our records meet the high standards required for an unqualified audit opinion. In particular, I want to commend Tony Pompa, my deputy for financial operations and systems, and his staff for their hard work and dedication. The city owes them its gratitude. I want to also thank the accounting firm of KPMG, whose highly professional staff worked equally long and hard during the past few months to successfully complete this complex audit. In particular, I want to commend Karyn Molnar, Jack Reagan, and Andrew Lewis for their efforts. Let me also take this opportunity to thank the Mayor, Mrs. Cropp, Mr. Evans, and the Council and the Inspector General for their guidance, support, and oversight of the process over the last few months. Their leadership and commitment to fiscal prudence was an essential part of this successful CAFR. As we continue to refine our financial systems and processes, it is my expectation that the annual CAFR process will become a routine event in the overall financial management of the District of Columbia. Now if you will turn to the financial charts, I will briefly walk you through them, and then answer any questions you may have. Thank you. SUBJECT: Whether the District of Columbia Public Schools may have violated the District of Columbia Home Rule Act and federal Anti-Deficiency Act by obligating and/or spending funds in excess of an authorized appropriation during fiscal year 2001. This responds to your oral request to my staff this morning for an opinion regarding the above-noted issue. Your staff has provided this Office with information concerning the specific amount of the congressionally-approved appropriation for the District of Columbia Public Schools ("DCPS") in FY 2001, as well as later local and congressional actions that increased the specific amount originally approved by Congress (hereafter "DCPS's modified appropriation"). Your staff also provided this Office with information concerning the aggregate amount of all obligations and expenditures by DCPS during FY 2001. I understand that, based on this information, you conclude that the amount of all obligations and expenditures by DCPS exceeded DCPS's modified appropriation. Assuming this to be true, and for the reasons discussed below, I conclude that DCPS may have violated the District of Columbia Home Rule Act and the federal Anti-Deficiency Act with respect to DCPS's modified appropriation. Your staff has provided this Office with an exhibit that shows: (1) the specific amount that Congress appropriated for DCPS in FY 2001; (2) the net of all local and congressional modifications during FY 2001 to that amount; and (3) the aggregate amount of all obligations and expenditures by DCPS during FY 2001 that count against DCPS's modified appropriation. A copy of that exhibit is attached. The exhibit shows that the specific amount that Congress appropriated for DCPS in FY 2001 was $769,943,000. The exhibit shows, in the column labeled "Revised Budget," that the net increase in that amount resulting from local and congressional modifications was $36,366,000, for a total authorized appropriation of $806,309,000. I understand that this increase resulted from three kinds of budget actions. First, reprogrammings. Second, your certification of funds from the carry-over of unexpended Reserve money from FY 2000, as described in the "FY 2001 Proposed Operating Budget and Financial Plan, Making the Vision a Reality," prepared by the Mayor, Council, and Financial Authority for Congress, dated June 9, 2000, pp. H-18 and H-19 (hereafter "FY 2001 Budget Book"). Third, use of workforce investment and other funds made available in the supplemental FY 2001 appropriations act for the District government, approved July 24, 2001, Pub. L. 107-20 (hereafter "FY 2001. Supplemental Appropriations Act"). The exhibit also reflects, in the column marked "Actual Expenditures," your conclusion that the total of all obligations and expenditures by DCPS in FY 2001 was $817,227,000. The column marked "Variance" reflects your conclusion that this total exceeded DCPS's modified appropriation, $806,309,000, by $10,918,000 (i.e., the difference between $817,227,000 and $806,309,000). Section 446 of the District of Columbia Home Rule Act ("Home Rule Act"), approved December 24, 1973, Pub. L. 93-198, 87 Stat. 801, D.C. Official Code § 1-204.46 (2001), generally prohibits District government employees, including employees of the DCPS, from obligating or spending funds under District control, no matter where these funds come from, unless the obligation or expenditure has been authorized by Congress.1 Congress authorizes obligations and expenditures by the District government by means of an appropriation - an act passed by Congress and signed by the President that expressly authorizes the government to obligate and spend money. The federal Anti-Deficiency Act is a series of laws (now codified at 31 U.S.C. §§ 1341, 1342, 13491351, and 1511-1519) that were initially enacted in the 1800's and amended over the years to address various financial abuses by government officials. By its terms, the Anti-Deficiency Act is applicable to both the federal and District governments. Section 603(e) of the Home Rule Act, D.C. Official Code §1-206.03(e), confirms the continued applicability of the Anti-Deficiency Act to the District government.2 In addition, pursuant to section 603(a) of the Home Rule Act, D.C. Official Code §1-206.03(a), the U.S. Comptroller General continues to have a role in interpreting the congressional appropriations acts for the District; thus, the Comptroller General's opinions under the Anti-Deficiency Act are guiding precedent in deciding your question. (B) involve either government in a contract or obligation for the payment of money before an appropriation is made unless authorized by law. Any violation of this prohibition may subject the responsible employee or official to disciplinary action and criminal penalties. See 31 U.S.C. §§ 1349 and 1350. I have reviewed the Anti-Deficiency Act and the FY 2001 Appropriations Act for the purpose of identifying any provisions that might allow the line item of $769,943,000 for DCPS to be exceeded. I have considered the grounds that were used to increase this appropriation to $806,309,000, as shown in your exhibit. I conclude that, in theory, the grounds used -- i.e., reprogramming, certification under the FY 2001 Budget Book, and appropriation for workforce investment and other objects under the FY 2001 Supplemental Appropriations Act - are appropriate. I lack information as to whether these actions were properly carried out. For purposes of this expedited opinion, I will assume that the reprogrammings, the certification under the FY 2001 Budget Book, and the use of funds under the FY 2001 Supplemental Appropriations Act; were, in fact, properly carried out.6 If the reprograrnmings, the certification under the FY 2001 Budget Book, and the use of funds under the FY 2001 Supplemental Appropriations Act were properly carried out, then, according to the exhibit, DCPS's modified appropriation was $806,309,000. This would have been the maximum amount available for DCPS obligations and expenditures during FY 2001. Also, according to the exhibit, you have concluded that the aggregate amount of all obligations and expenditures by DCPS that count against its modified appropriation is $817,227,000. As shown in the exhibit, this amount exceeds DCPS's modified appropriation by $10,918,000. The Home Rule Act and the Anti-Deficiency Act prohibit any District government agency from obligating and spending in excess of an appropriation. Consequently, it is my opinion that, if DCPS's total obligations and expenditures exceeded its modified appropriation as shown in the exhibit, then DCPS may have violated the Home Rule Act and the Anti-Deficiency Act with respect to its appropriation for FY 2001. If you have any questions concerning this opinion, please don't hesitate to call me at 724-5524. 1. Section 446 provides, in relevant part, that "no amount may be obligated or expended by any officer or employee of the District of Columbia government unless such amount has been approved by Act of Congress, and then only according to such Act." 2. Section 603(e) provides: "Nothing in this Act shall be construed as affecting the applicability to the District government of the provisions of section 3679 of the Revised Statutes of the United States . . ., the so-called Anti-Deficiency Act." 3. Other agencies covered by the lump sum of $998,918,000, to which Congress has allocated specific line item amounts within that sum, are the University of the District of Columbia, the State Education Office, the District of Columbia Public Library, the District of Columbia Public Charter School Board, and the Commission on the Arts and Humanities. 4. Whether there is additional language that would allow the lump sum of $998,918,000 to be exceeded is beyond the scope of your question or this opinion. 6. For example, section 111(a) of the FY 2001 Appropriations Act contains requirements for reprogramming, i.e., the shifting of funds within an appropriations title for an object in an amount that is different than the amount considered for that object when the budget was being enacted into law. Other requirements for reprogramming are set out in the Reprogramming Policy Act of 1980; effective September 16, 1980, D.C. Law 3-100, D.C. Official Code § 47-361 et seq. If these reprogramming requirements were followed, then the line item of $769,943,000 for DCPS could have been increased through the shifting of funds to DCPS from other purposes that were appropriated within the $998,918,000 lump sum for public education. Similarly, if the requirements for carry-over of unexpended Reserve money from FY 2000 were met as described in the FY 2001 Budget Book, then up to $12,079,000 of that money could have been added to the line item of $769,943,000 for DCPS.